“A photovoltaic power generation installation is made up of different elements such as: modules, support structures, fuses, cables, terminals, varistors, disconnectors, switches, connecting boxes, etc. The most important device connected into the grid is the inverter, upon which the correct and efficient transfer of the power generated depends. The inverter current output waveform shall meet a series of requirements from the point of view of signal quality, such as the power factor and the harmonic distortion. Technical doubts arose regarding the interpretation of the “equivalent means” and, in response, the Ministry of Industry, Tourism and Trade issued the “note for the technical interpretation of the equivalence of the galvanic separation of the connection of low-voltage generation installations”. 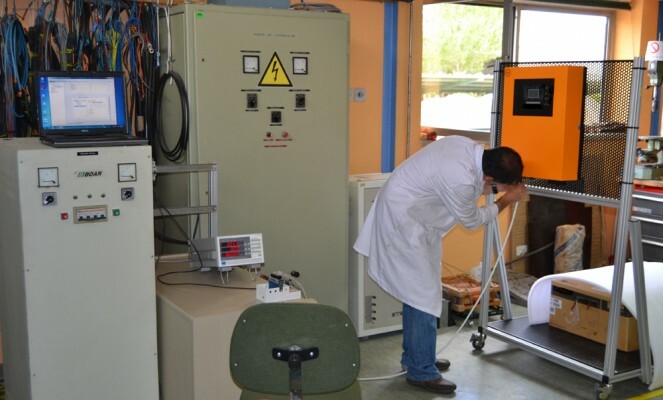 ceis has been approved by Gas Natural – Fenosa to conduct tests on the Measurement of the Direct Current Injected into the Grid with an Inverter.